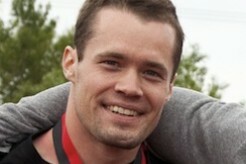 I'm 27 year old CrossFit athlete from Finland. I started CrossFit in August 2009 and before that I competed in track&field. I'm unaffliated and I train at the globo gym and in my backyard. I represent Cross Gym brand. great job! you are an inspiration to me because we are the same age and I sometimes think my performance can not be as good as someone ten years younger, but it is not true! Thanks and COngratulations! Thanks! Haha, that's quite coincidence!! Good luck with the Open as well. Mikko, great performance. Funny thing is, we look very much alike! You might not tell from my picture, but all my friends agreed after seeing you perform. Good luck with the rest of the WOD's! Thanks man!! And good luck to you as well! Thanks!! We'll see how it goes. Being Mikko, from Finland, can't really be that bad ;) Best of luck with the Open! Thanks guys!! And good luck to you as well!! © 2011 CrossFit, Inc. CrossFit is a registered trademark and Fittest on Earth is a trademark of CrossFit, Inc. All rights reserved.